photo by Pastor Jerry We were blessed with the opportunity to minister at CCLivingwater. Pastor Jerry allowed us to share on what has been happening in Okinawa. We had a great time of worship led by Royce, and then Joanna and I went up and shared on the ministry in Okinawa. After we shared I taught the Word. Again, we were so blessed to see our family in California. Aaron Megiede showed up with his family. Aaron had surgery on his knee so he won't be jumping off any platforms lately. In the picture above is Hannah helping out at the e3missions booth. We brought a lot of stuff to share with the body. Hi everyone! Let me introduce to you Amber. 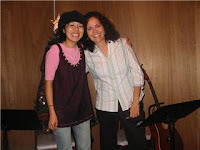 She will be our new intern at CCBC Okinawa. She will be arriving on January the 17th. We are so blessed as she will be coming to assist in ministry at the College. Please continue to pray for her as she makes final preparations to be here. When you get a chance please click the comment button below and leave Amber a welcome greeting. Christmas morning came so fast. Pastor Tom's parents came over in the morning, and we opened our presents. Asa was so excited! (upper left pict) Zach was excited because he got those pair of sandals that he has wanted for some time now. Tom's dad could not understand all the excitement, those shoes are hard to walk with. The day went fast, and in the evening we went to the Duran's for Christmas Dinner. Christmas Eve Joanna and I headed out to the Newell's house to deliver some presents from Tim and Ayu. As we knocked on the door, Tim's Dad (Dan) answered the door as He was speaking to Pastor Tim in Okinawa. A coincidence? Not really, just God's timing. Some of you might remember Tim's Dad, he is pictured in the middle wearing the hat. He showed us some pictures of Pastor Tim, but this one was the best, Tim in High School. What happened to that good looking guy? Just kidding! Ayu would say he looks much handsomer now. 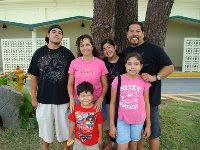 This blog is for all of the former Bible College Students here in Okinawa. We are in California and we found this bag of Cereal. In Okinawa they are called Marshmallow Mateys, but here in California they are called Magic Stars. We cannot get away from these things. You either love them or hate them. To tell you the truth, I really got a good tasting for them. Captain Mark Davis (Keegan's Dad) invited us to a Christmas Luncheon that his company puts on this time of the year. We ate a lot of turkey, Ham and all the fixins. We had a lot of fun. Oh yeah, for those of you who do not know Mark Davis he is the serious guy in the upper left hand corner of the picture. This is a cool picture of him, but if it was really him, he would have a huge smile on his face. Mark is such an encouraging brother. This picture is his battle face, you would not want to meet that guy on the battlefield. Towards the end of the afternoon Santa showed up and Asa was blessed with this bag of goodies. The Bible College students are gone, but ministry still goes on. Pretty good rhyme ya! It was different not having the students with us, but hey, Keegan is still here! We were blessed with many of the common faces, as well as God continues to amaze us by bringing in new ones. Please continue to pray for us here in Okinawa, that God will bless Rick in Okinawa city, Masaru in Naha city and us here in Ginowan city. 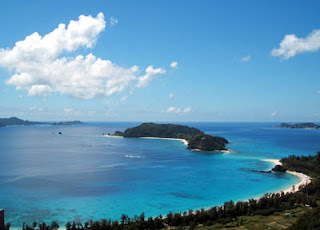 This island is big, and we want to reach all of the island for Jesus Christ. God has opened some huge doors for us to rent the building next to the Koinonia Cafe. For the past few months God has given us a vision to start a thrift shop for the Okinawan people who are in need. Jesus has been speaking to us about reaching out to the less fortunate here on the island. The building will need a lot of work, but nothing is too hard for the Lord to do. Jesus in Luke 4:18 tells us "The Spirit of the Lord is upon Me, because He has anointed Me to preach the Gospel to the poor". The less fortunate are in the heart of Jesus. Can you help us come up with a name for this new ministry? We are throwing around a few thoughts. When you get a chance can you click the comment button below and give us a few names that come to mind. Please pray for us as we step out in faith with Him. The party was off the charts! We had such a wonderful time this night. We invited all of the students that we teach english, to attend our Christmas party. Most of them did and it was so much fun. The reason behind teaching english is to gain friendships and share the Love of Jesus Christ in a personal one on one way. During the night we shared the real meaning of Christmas and why it means so much to us as believers. Please continue to pray for the students, and the teachers who teach at Gogo Eigo. 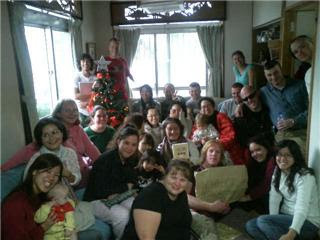 In the upper left, are all of the teachers of Gogo Eigo, and to the upper right are most of the students. Many of the students brought friends for this special night. Hi everyone! This is Dan and Debe's daughter Emi. She turned 2 years old the 18th of December. The Pallman's are expecting their second child in March. It is such a blessing to have Emi and her parents a part of our lives here in Okinawa. They are packed up and ready to go. Look at all that luggage! Aaron and Joel leave at 11:30am, then the rest of the group will stay out in Naha and do some more shopping. Then, Mark and Nicky leave around 2:30pm and last but not least, Doug and Brad will leave Naha Airport around 8:00pm at night. We are going to miss all of you, be blessed and keep serving the Lord. Love, your family in Okinawa. 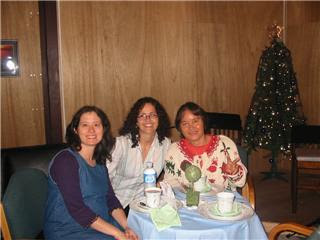 Saturday night the gals had a Women's Christmas Tea. 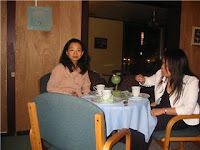 They gathered at the Koinonia Cafe and had a good time. Many people in Okinawa do not know the real meaning of Christmas. We want to continue to proclaim the Love of God during this important holiday. Today we arrived at the Bible College for the last day of class. We had devotions at the church in the morning. When we got there, all of the girls and some of the guys dressed and looked like Pastor Tommy. They were such a crack up. We are really going to miss the crew from this semester. Please continue to pray for them as they prepare to go back home.